Deeping Rangers are ready to do themselves justice in the biggest game in the club’s history. The leading United Counties Premier Division club host National League North side Kidderminster Harriers - they were a Football League club as recently as 2005 - in the second qualifying round of the FA Cup tomorrow (12.30pm). Kidderminster celebrate victory over Posh in the FA Cup in 2014. And to add some glitz and glamour to the day the FA Cup trophy will be on display at the Haydon Whitham Stadium from 10.30am. Photo opportunities will be available. And to add even nore magic to the occasion the BBC will be streaming the game live on their website. “It’s the biggest game in the club’s history,” Deeping manager Michael Goode insisted. “And we are hoping to attract our record attendance. “We are keen to attract Posh fans as their team is playing away and Stamford fans as they don’t kick off until 3pm. “We are also hoping to get the people of Deeping to turn out in force. This is an event as well as a football match for the people of Deeping. “I urge as many people as possible to come and watch us. They will like what they see. “It’s an exciting occasion. We have drawn one of the biggest clubs in the competition at this stage and the BBC here doing their stuff just makes it all bigger and better. “Kidderminster are still a full-time club so it will be massive challenge for us, buthatever happens on the pitch though we will relish and enjoy the occasion. “At our level we might play live on television once in our careers if we are lucky so we are determined to make the most of it. “We think we can win the game as well. We have won three games in a week so we can relax and enjoy this game. “The pressure is off us. I didn’t bother going to watch them as we only train for 75 minutes tonight (Thursday) so what could we actually prepare for in that time? Deeping’s record gate is 635 for the visit of Rushden & Diamonds in an FA Cup tie at the same stage of the competition in 2015. 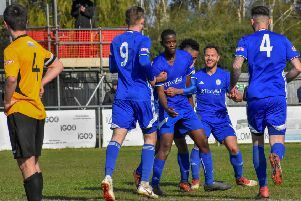 Deeping have never progressed past the second qualifying round whereas Kidderminster knocked Posh out of the FA Cup in a third replay at the ABAX Stadium in 2014 when a National League team. They also previously beat a Birmingham City side managed by Barry Fry in the competition.